Sow directly outside in a well prepared seed bed in shallow drills (1.5cm deep) from mid April until June. Chard, perpetual spinach, sugar beet and annual spinach. Beta is the Latin term for beetroot; or from the Celtic bett, meaning red. Vulgaris means common. Beetroot are delicious and very easily grown vegetables. From just two sowings you can get 8 months supply of roots. They do not suffer from any pests and diseases. The secret is to avoid any growth check otherwise the plants may bolt or become woody. If you haven’t eaten home-grown beetroot yet you will be in for a treat. Beetroot originates from Northern Africa and Western Asia and was used as a food plant for at least 2000 years. The Romans introduced the beetroot into Northern Europe. The Celts grew a white beetroot (Beta rapa). Red Beetroot was first mentioned in the 13th century in northern Italy. 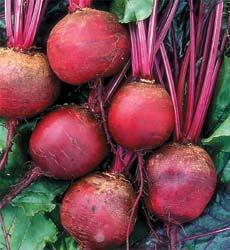 It was only in the 17th century that the red beetroot became the main type in Europe. The wild beet, Beta vulgaris subsp. maritima is a common seaside plant in south and west Europe. The most popular beetroot is the red and round (known as globe) type, but there are also yellow and white types available. A very interesting variety to grow is ‘Barbietola di Chioggia’ which has alternating red and white rings. Some years they were absolutely delicious and then the following year they were tough and woody. There are also long cylindrical beetroot. These are ideal for pickling as all the slices are the same size. They also tend to be higher yielding. Beetroot prefers light, well-drained soil. Fresh manure application before sowing should be avoided, a dressing of old compost incorporated in early spring is very beneficial. Beetroot is one of the easiest vegetables to grow so even on heavy soil you can grow excellent beetroot, provided you have raised beds (to improve drainage). It is very important to remember that most beetroot seeds are clusters of more than one seed. This means if you sow one seed, you will have three to five seedlings germinating. These have to be thinned to one seedling soon after germination otherwise the beetroot will remain very small. Many modern varieties have single seeds. 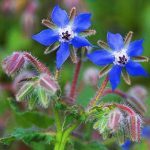 If you want to buy these you have to look out for ‘monogerm’ varieties in seed catalogues. Early varieties for summer use can be sown directly outside in a well prepared seed bed in shallow drills (1.5cm). I never had much success with the early sowings in March. The earliest I would start is in late April, but you get a much better crop in May. For the early sowing in April make sure you use a bolt resistant variety such as ‘Boltardy’. Some gardeners prefer to raise the seedlings in large modular trays. If you try this method make sure that you plant the seedlings out when they are still quite small. 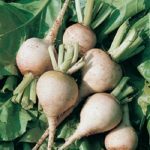 I always found beetroot very easy to sow directly outside as the seeds are large enough and easy to handle and I do not want to clutter up valuable propagation space. Maincrop varieties are best sown directly outside like the early crop in the last two weeks in May or even into June if you missed these times. During that time they germinate very quickly (7-10 days) and grow very fast. The reason for getting woody, tough beetroot is often slow growth. Final spacing: 20cm between the rows and 10cm between rows. Final spacing: 25cm between the rows and 10cm between rows. I initially sow the seeds about 2.5cm apart and then thin them in two stages. The first thinning is done a couple of weeks after germination. I remove all unwanted seedlings from the clusters (not for monogerm varieties) and leave one seedling every 5cm. The thinnings rarely do well when transplanted. If you have gaps in the rows you are better off sowing a few new seeds. When they reach the baby beetroot stage you can harvest every second plant. These are delicious and you can also cook the leaves like spinach. This allows the remaining plants to fully develop. Beetroot and other members of the goosefoot family are not prone to any specific pests and diseases so you do not have to be too fussy about rotation. You could use them as ‘flexi-crops’ or gap fillers. Apart from keeping the crop weed free and properly thinned to the required spacing, there is no other maintenance required. Early beetroot can be harvested throughout the summer at whatever size you prefer them or whenever you want some beetroot. It is best to twist off the leaves to avoid damage and bleeding of the roots. Maincrop beetroot for storage should be left until October. 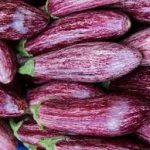 Of course, if you want to eat some before then there is no problem, but if you grow some for storing you should let them mature until October. Beetroot is an excellent winter vegetable and stores extremely well in boxes of damp sand (see page ). One year I had beetroot until May of the following year and they were still as good as freshly harvested roots. Beetroot is one of the easiest vegetables to grow. There is no specific pest or disease that affects beetroot. Slugs may eat young seedlings especially if sown too early or if the garden is a bit wild, but generally they would go for the other vegetables first. Beetroot is very sensitive to a deficiency of boron in the soil. The symptoms are brown sunken patches on the roots and black areas inside the root. You may eat 3 reasonable sized beetroot per week. Beetroot will store safely in boxes of sand in a shed from October until the end of April which is 28 weeks. 28 weeks multiplied by 3 beetroot per week makes a total of 84 beetroot. If your spacing is 10cm in the row you get 4 rows in a bed (bed width: 1.2m) you will get 40 beetroot per meter of your bed. In only 2 meters of your bed you can grow enough beetroot to give you a few roots for 28 weeks!